This USB 3.0 Active Repeater Cable can easily extend your USB 3.0 cable up to 3 meters. Comparing with a "passive" repeater cable, our cable is an "active" one that buffers and regenerates upstream and downstream signals to ensure signal reliability and performance. 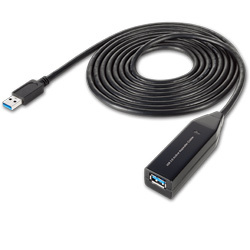 This USB 3.0 repeater cable support data transfer rates up to 5 Gbps and is fully backward compatible with USB 2.0/1.1 devices. Therefore, Super Speed, high speed and full speed (including low-speed) USB devices/cables will function equally well with this USB repeater cable. Active USB repeater cable, assuring signal quality and reliability. Super Speed transfer rate at 5 Gbps. Repeater cable length is 3 meter. Connect to USB device or 2nd active repeater cable. 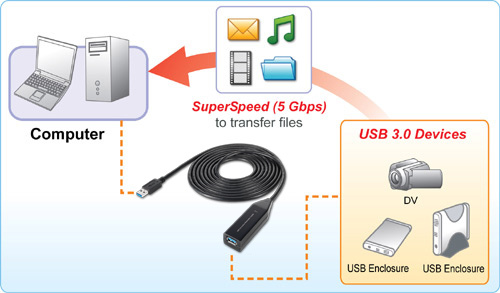 USB 3.0, 2.0 and 1.1 compliant, works with Super Speed, High, full and low speed USB devices. Support Windows® XP, Windows Vista® , and Windows® 7.